Way out past Pluto, in the region of asteroid-filled space known as the Kuiper belt, NASA probe New Horizons just got a tantalising hint of a long-sought structure in the outer Solar System. An ultraviolet glow picked up by the probe's Alice UV spectrometer could be evidence of the 'hydrogen wall', a region of dense hydrogen on the boundary between the Solar System and interstellar space. 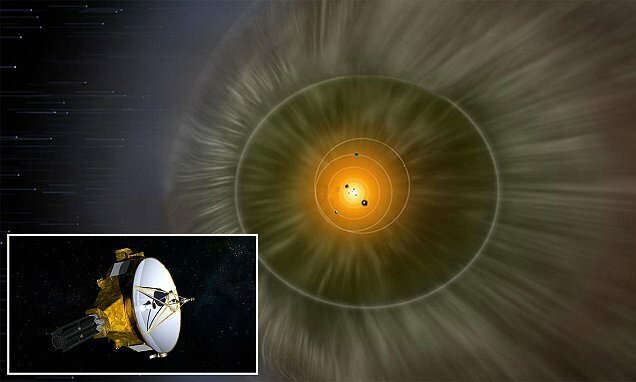 “We're seeing the threshold between being in the solar neighborhood and being in the galaxy,” astronomer Leslie Young of the Southwest Research Institute and New Horizons team told Science News. Although space has extremely low pressure, it still exists, and the solar wind exerts an outward pressure. At a certain point, however, that wind is no longer strong enough to push back against interstellar space. This boundary is known as the heliopause, which marks the official edge of the Solar System.Just on the other side of the heliopause, neutral hydrogen atoms moving through interstellar space should, theoretically, slow down when they reach that barrier - a sort of neutral hydrogen "traffic jam" that causes a buildup next to the heliopause. Between 2007 and 2017, New Horizons detected a distinctive ultraviolet glow called the Lyman-alpha line, produced by solar photons hitting the hydrogen atoms and scattering. This occurs as sunlight travels through the Solar System. But there's a mysterious background source in the signal detected by New Horizons, much farther away. This was also detected by Voyager 30 years ago. New Horizons is the first probe in all that time that has had the same opportunity to take measurements of this phenomenon - and its best explanation is the hydrogen wall. The background glow could be something else, farther away out there in space; the only way to be sure is to do more sciencing. Which means more Alice observations with New Horizons - around twice a year for the foreseeable future, according to the paper. Voyager 1 has already moved on into interstellar space. It breached the heliopause in 2013, and is still beaming signals back to Earth as it moves farther and farther away into the infinite cosmos. Voyager 2 is in the heliosheath, the outer reaches of the Solar System where the solar wind is slowed by interstellar gas. It's expected to cross the heliopause sometime before 2030. New Horizons won't reach that point until sometime after, but if it's still in operation, it may be able to take more observations as it glides through. Which is quite a comforting thought, really: humans may come and go, but our scientific efforts live on.In the meantime, New Horizons has other work to do. It's already dished the dirt on Pluto, which it flew past in 2015. The probe's next encounter will be with a Kuiper belt object named Ultima Thule, a minor planet the probe will explore on 1 January 2019.